As I said earlier, I am on a fridge/freezer/pantry cleaning spree these days. I should say I am pretty much on the right track so far. There is still a long way to go before I can say I am successful in the “mission”. 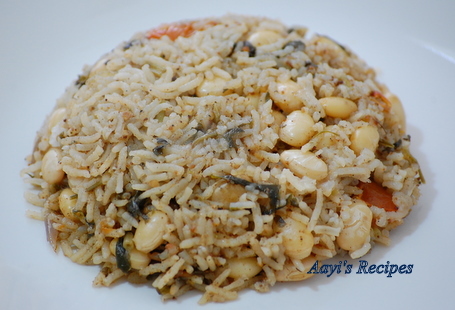 This is a hearty and delicious rice I prepared last Sunday. I served it with a cold yogurt and we had a very filling lunch. I think I am going to make this regularly hereafter. Soak avarekalu overnight (or for 3 hrs in warm water) and cook them in pressure cooker. Heat oil (and a little ghee for extra flavor), add bay leaves, green & black cardamom. Now add onion and fry for few minutes. Add tomato, salt and cook till tomatoes becomes mushy. Now add methi, rice and spice mixture. Fry for few minutes. Add in cooked avarekalu (along with water used for cooking). Mix everything very well. Add about 2 cups of water (reduce the water amount if avrekalu cooked water is used). Cover and cook on a low heat till done. Nice dish with both lentils and rice and vegetables. Looks yummy! It looks good & too tempting…. I love such preps…as always…. i think you undestend my mind, because i have newly purchase ONIDA microwave (25ltrs.) and when i was in Germany, i have eated LASAGNE which was so nice having cream and spinech. and you have put the recipe on web, and in BARODA, Guj. the lasange is available, so now i can make it. once again thanks, when i make it, i will send you photo. good bye and have a nice recipe. Thanks for giving the recipe. I have been looking out for one of such recipe. Hey Shilpa.. Thanks for sharing this recipe.. I recently posted a similar rice based on your recipe. Needless to say, I love this dish! Thanks! It came out extremely flavourful and tasty. Thanks a lot !